I always look forward to seeing what Tanya of Mrs. Hughes is up to. Her vintage leaning garments are always chock full of beautiful details and she tells a wonderful story about each of them. 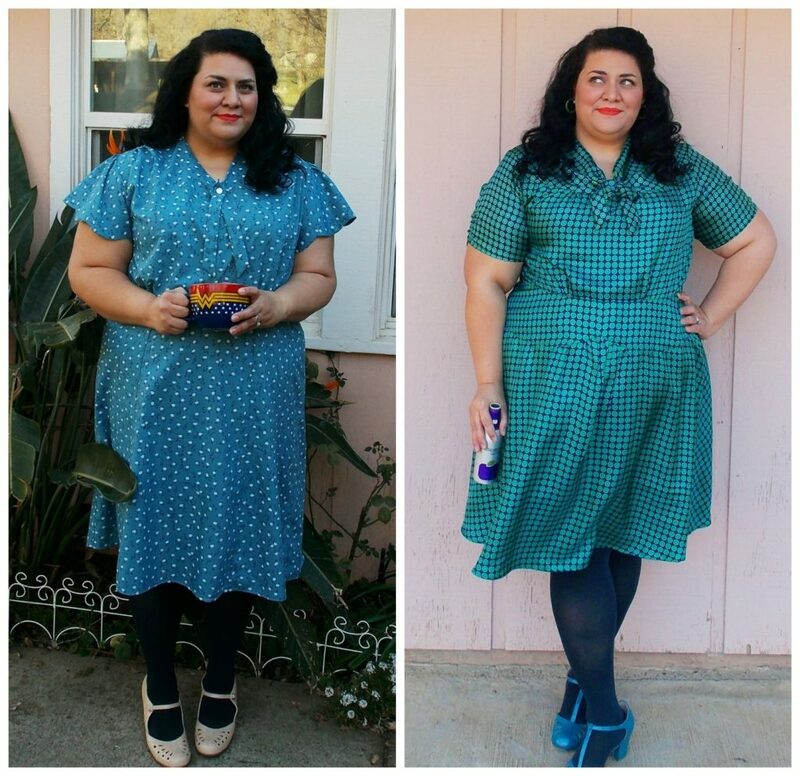 Her dresses for The Day and Night Dress Challenge are indeed true to her style, and I’m so delighted that she decided to join in this challenge. Welcome Tanya! 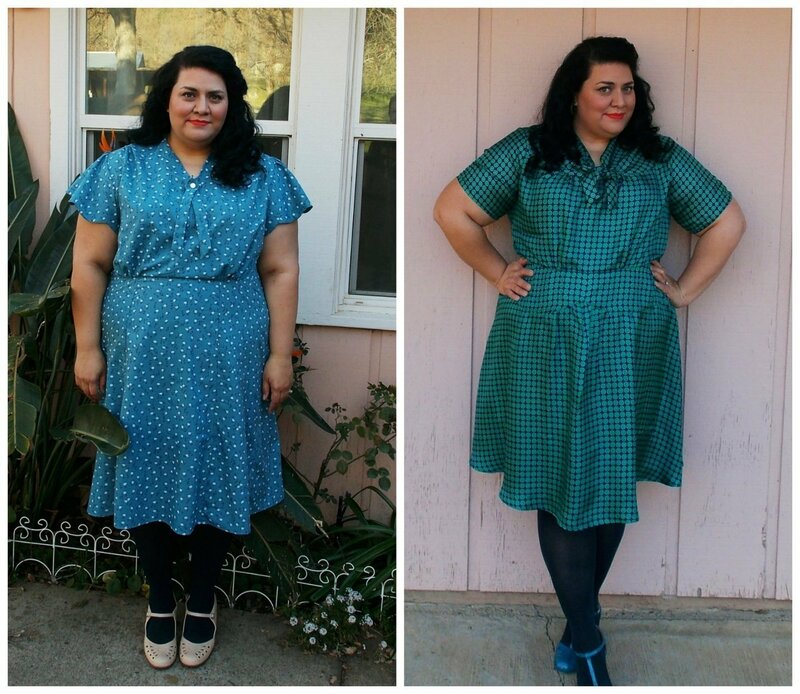 I’m excited to take part in the Day & Night Dress Challenge hosted by Elizabeth! 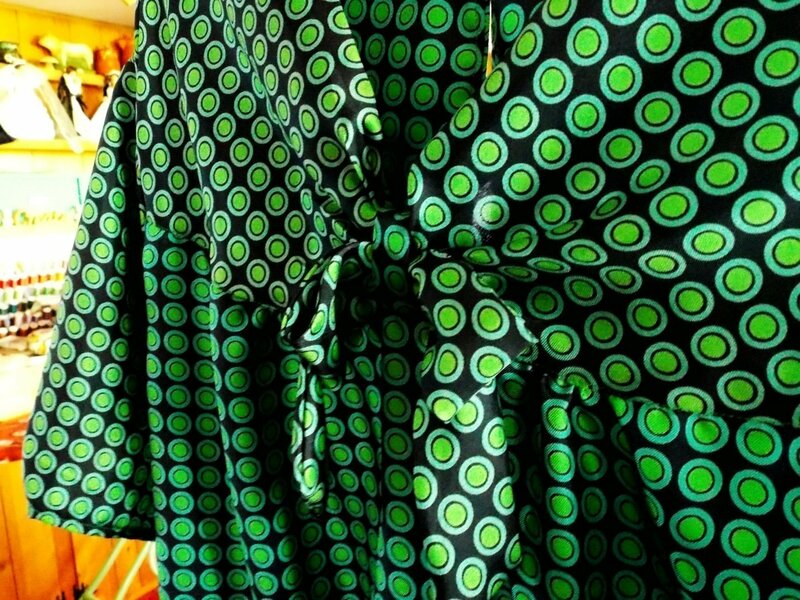 If you follow my blog, Mrs. Hughes, you’ll know that I love sewing dresses. 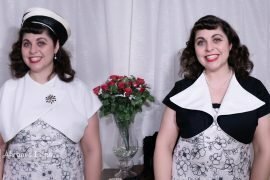 Both of these patterns were already in my sewing queue and fit right in with this challenge. Along with that, they were also on my #makenine2018, so it was a triple score! 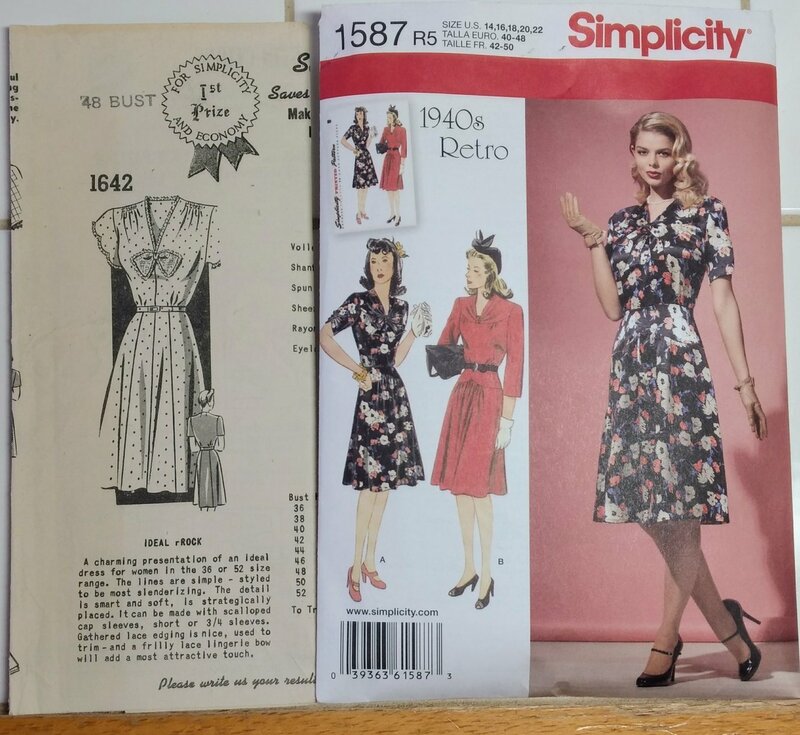 For my patterns, I chose a 1940’s mail order dress pattern and Simplicity 1587, a 1940’s pattern re-issue. Both patterns are a similar style and at first glance appear quite similar, but are actually very different. 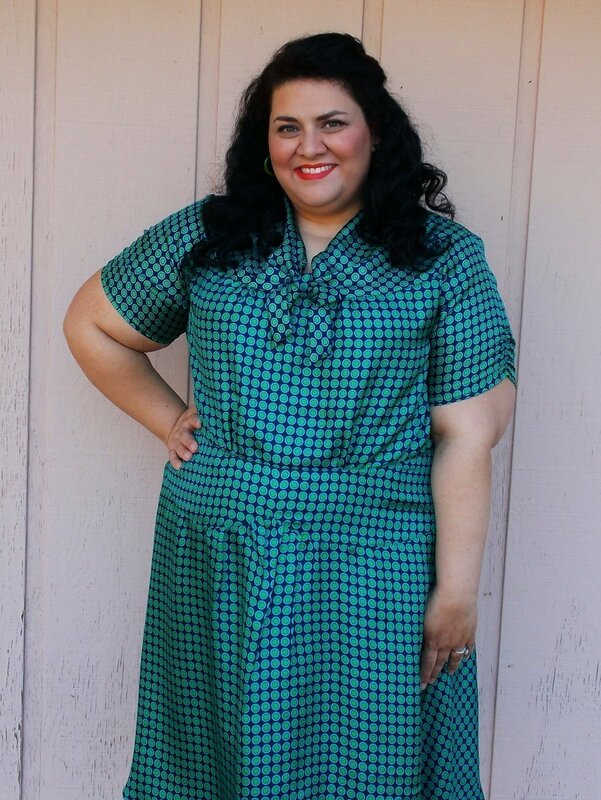 I had limited yardage for this pattern and as it’s vintage fabric, there was no way to get more. I made it work by shortening the skirt by 6”, slimming down the skirt gores and piecing the sleeves. I didn’t have enough fabric to cut the bow, and had to make a slimmed down version which wasn’t long enough to tie into a bow. Due to my fabric shortage, I also didn’t have enough to cut out a self-fabric belt, which I would have loved to include on this dress. I added a button to the “ribbon” adornment on my bodice and I actually prefer this to the bow as I’m finding that I really am not much of neckline bow gal. 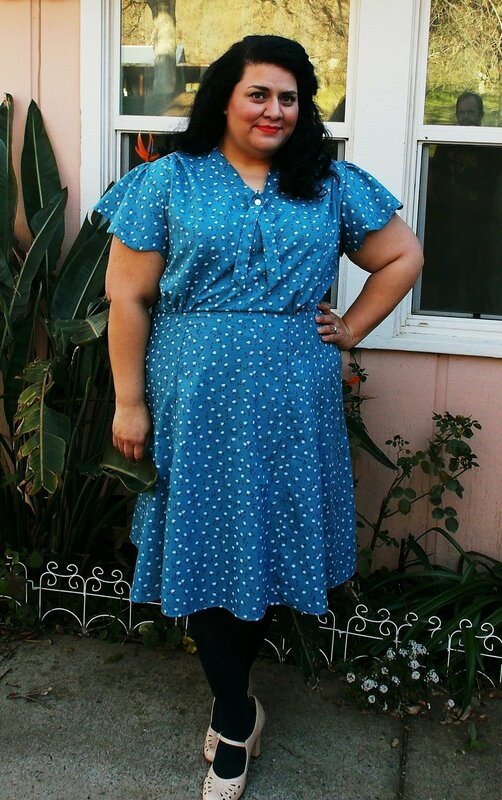 This was a pretty simple dress and I think that the fabric is perfect for pattern. I’m not sure that I’d make it again as I prefer a fuller skirt, but you never know. The skirt is meant to be fuller than I was able to cut it, so I might test it out again to see how it fits or perhaps just change the skirt to a gathered one as I do adore these sleeves. My “Cocktail Dress” is made out of a lightweight silk that’s almost the same weight as China silk. I envision wearing this one out out for cocktails or out to a nice dinner with my husband. We didn’t have any limes, otherwise I would have made myself a gin and tonic. Instead, my favorite blackberry cider from a local brewery will have to do. I don’t think my version looks anything like the pattern sample, although I didn’t make any alterations other than grading it up. I think the pattern would probably fare better with a fabric that’s a little heavier, even though it includes crepe de chine and georgette on the list of suggested fabrics on the back envelope. I think this mostly due to the “V” and the gathers on the skirt yoke. The bow construction is quite interesting, even though I think it’s not really my thing. 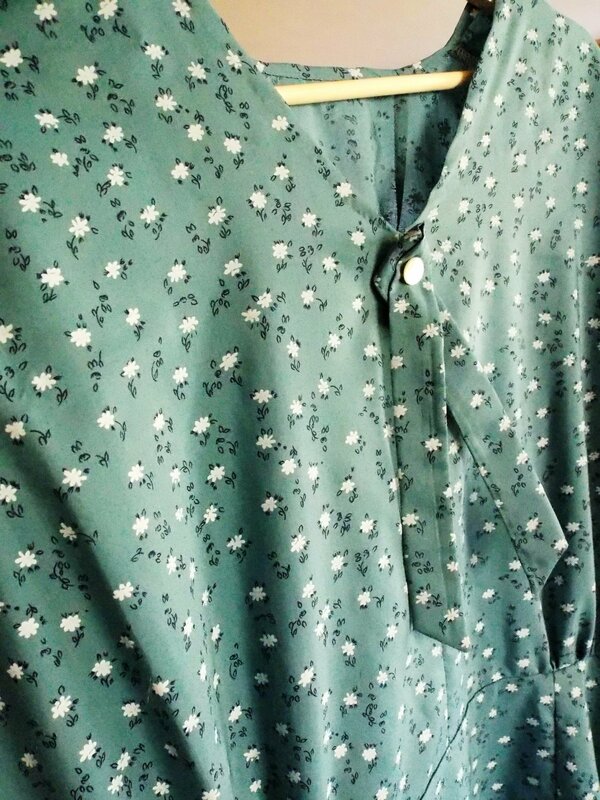 It has a “knot” sewn on to the neckline that creates those lovely gathers. The bow is then slipped through that knot and tacked on. It can be omitted as seen in View B on the pattern. The sleeves have a piece of elastic sewn underneath that pulls up and makes gathers on the sleeve. It’s a cool detail, but although I did a full bicep adjustment to the sleeves, I would have liked a little more room. The drawing on the envelope shows the sleeves rather fitted, so perhaps that is just how they’re supposed to be. I’m also not a huge fan of the skirt due to the gathers below the yoke. 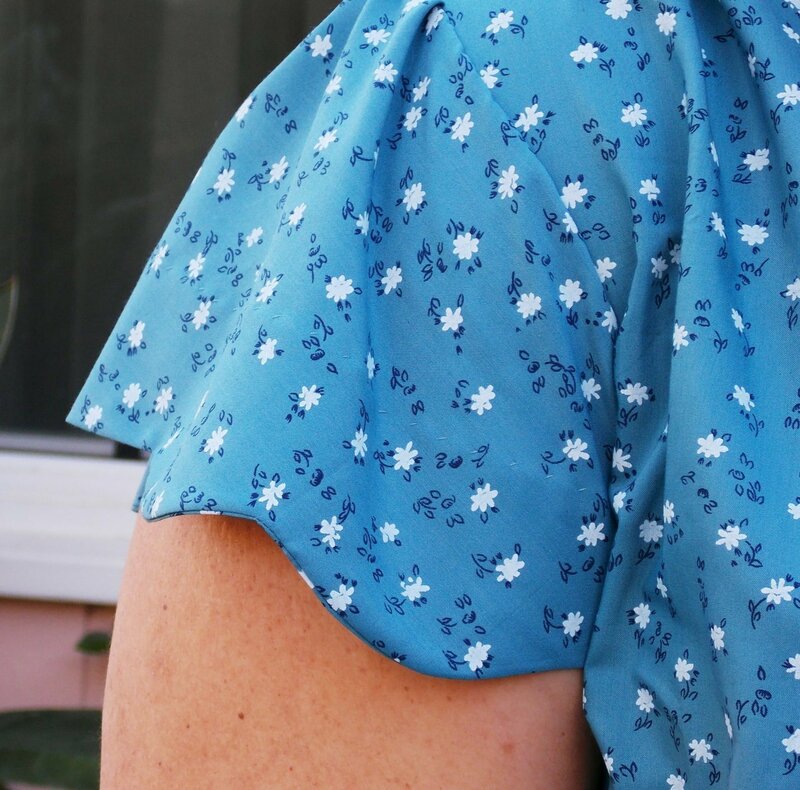 I was aware of this going in as I have some *ahem* bulk there and I don’t need gathers accentuating that, but as I like to try out different designs, I went ahead and sewed it anyway. I pressed the gathers down so that they aren’t so prominent, but if I ever made this pattern again (which is doubtful), I would change the skirt. Both are such lovely dresses! 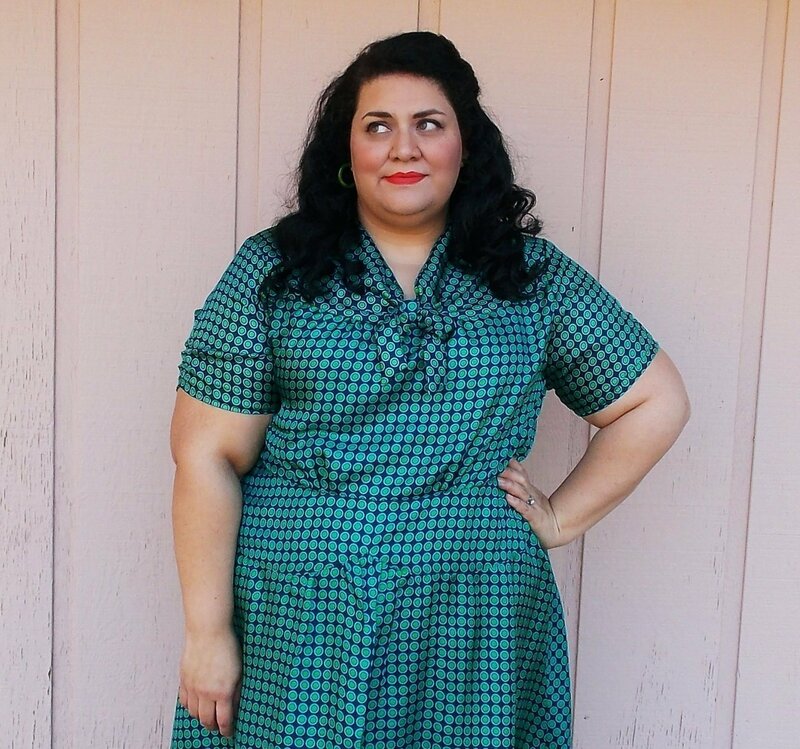 Love the patterns and fabrics and you look great in them! Love your dresses! I particularly like the way you changed the bow to a simple ribbon detail on your coffee dress – that works so well. Necessity often inspires creativity, doesn’t it? Tanz, these are so pretty! Such pretty vintage vibes going on here. Lovely!